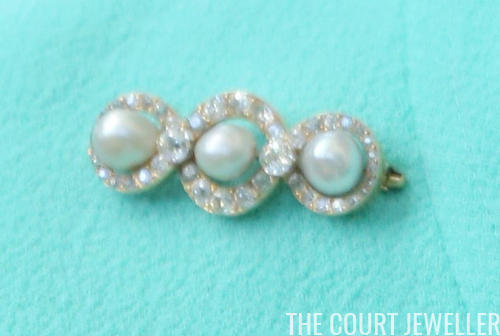 The brooch we're focusing on today isn't the grandest piece of jewelry that belongs to our Magpie of the Month, Queen Margrethe II of Denmark, but it is a jewel with a remarkable history that links three royal families: the Connaught Pearl Bar Brooch. The design of the brooch is simple: three natural pearls surrounded by diamonds and arranged in a horizontal bar formation, with extra diamonds studded between the clusters. The brooch appears to be set in silver and gold. The brooch originally belonged to Princess Louise Margaret of Prussia, who married one of Queen Victoria's sons, the Duke of Connaught, in 1879. She later gave the brooch to her younger daughter, Princess Patricia of Connaught. 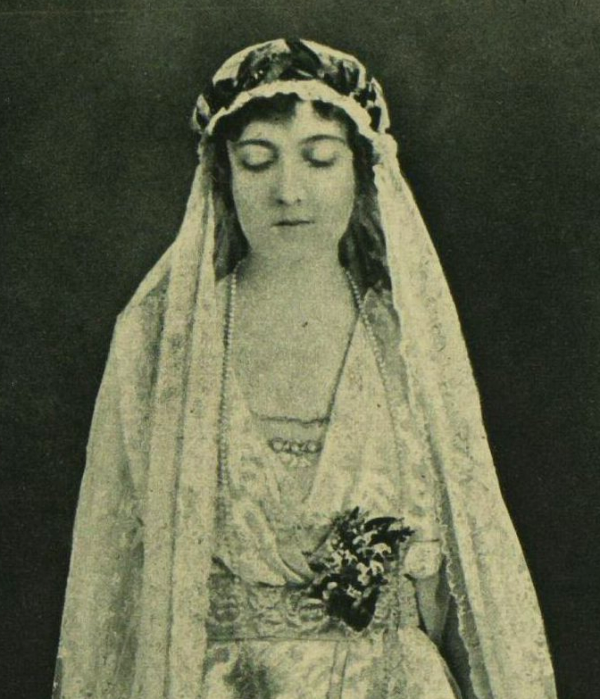 When Patricia married Alexander Ramsay in 1919, relinquishing her royal title in the process, she pinned the brooch to the bodice of her wedding gown. 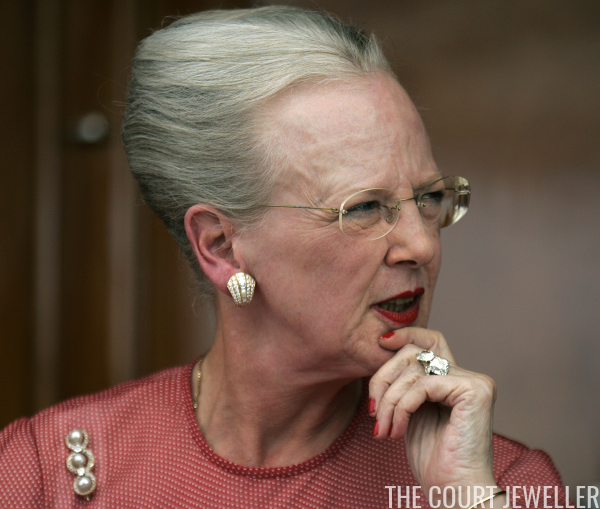 Margrethe often pairs the brooch with the same modern diamond earrings that she wore in Greece. Here, she wears the brooch and earrings together during an official visit from King Willem-Alexander and Queen Maxima of the Netherlands in June 2013. 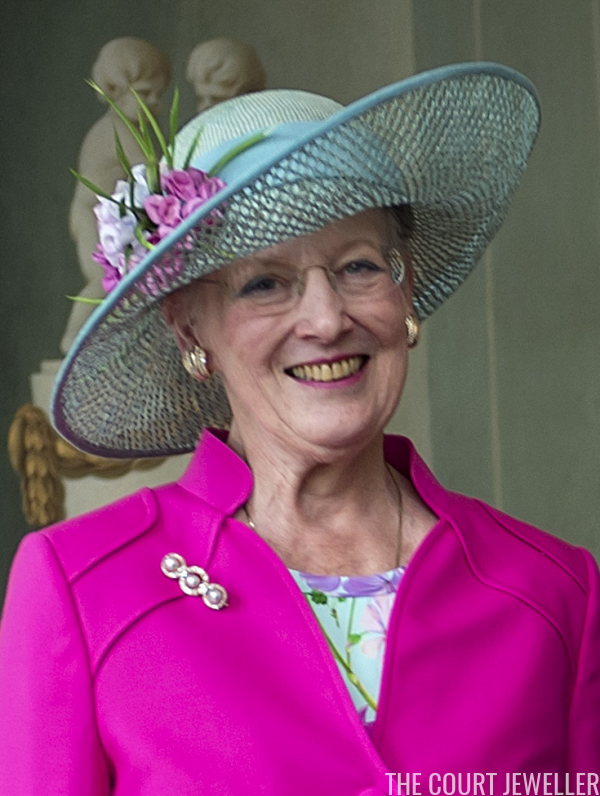 Margrethe wears the brooch on a variety of colors. 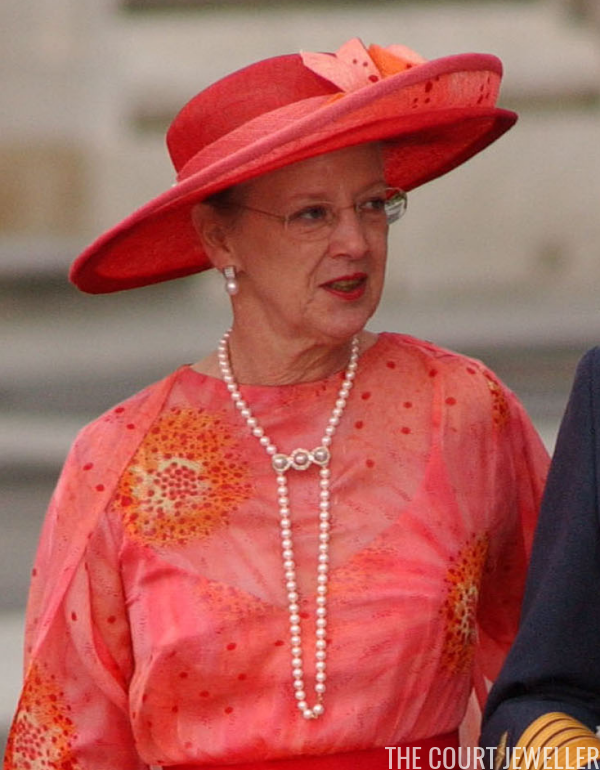 Here, she fixed the brooch on an orange-red ensemble for an IOC meeting in Copenhagen in October 2009. 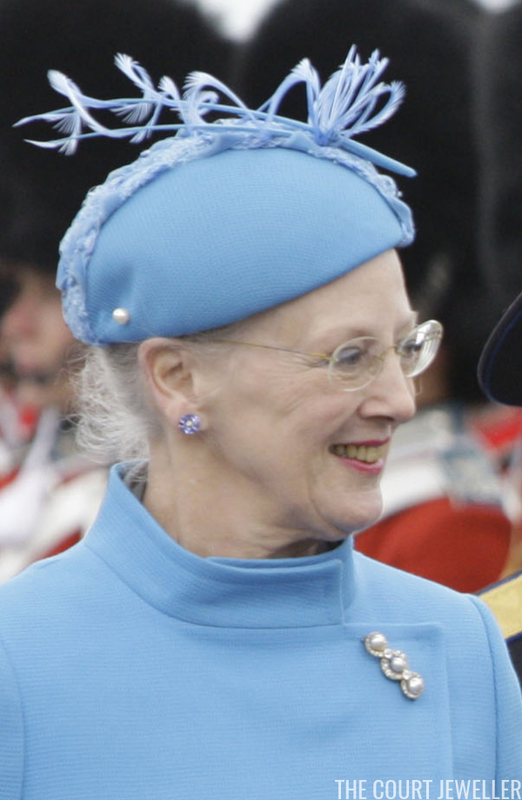 She also often wears the brooch with blue clothing, as she did for the start of the official Russian visit to Copenhagen in April 2010. 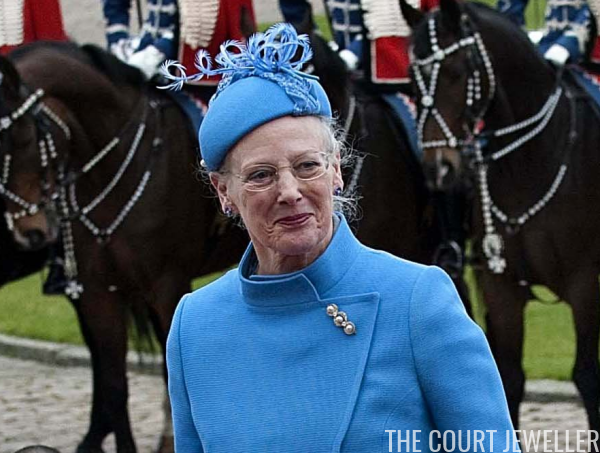 Although Margrethe often places the brooch traditionally on her chest, she has on occasion placed it in more unexpected ways. For a gala hosted by the Danish-American Society in New York in June 2011, she pinned the brooch in the center of her bodice. 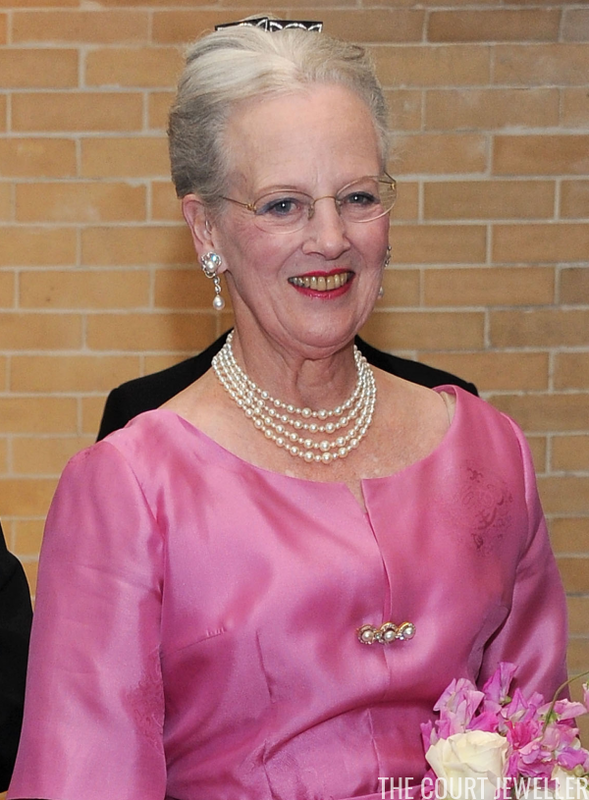 Margrethe has also used the brooch as an enhancer ornament on one of her pearl necklaces. She wore the piece this way in May 2004 for the Spanish royal wedding in Madrid, fastening the brooch horizontally near her neckline. 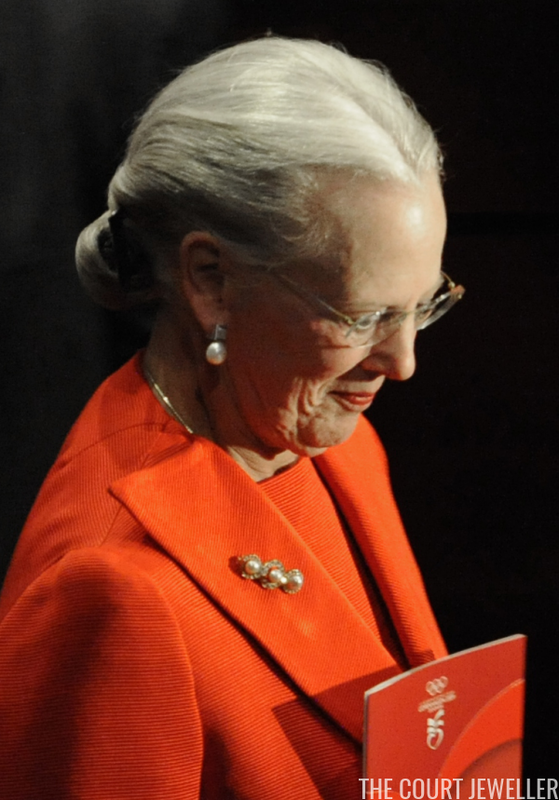 The brooch may not be a grand piece, but it has a grand family history -- something we know Margrethe values just as much.